Create or sign into your Jaanuu account, hover over “My Account” at the top of any page and select “Wishlists” from the dropdown menu. Not sure where to start? See our best sellers! On any product page, simply select your size and then click the heart in the corner or the “Add to Wishlist” button (you’ll see it below “Add to Cart”). And that’s it … you’ll be automatically entered in our contest! To be eligible, you must create and share your wishlist by 11:59PM PST on December 16th, 2018. Tune in on Instagram to join the festivities and see if you’ve won! The official terms and conditions are below. OFFICIAL RULES. The following are the official rules (“Rules”) for the Jaanuu “Win Your Wishlist” Sweepstakes (“Sweepstakes”). In order to enter the Sweepstakes, you must agree to these Rules. You agree that submission of an entry form and/or participation in the Sweepstakes constitutes your agreement to these Rules. 2. SPONSOR. The Sweepstakes is sponsored by Jaanuu, Inc. (“Sponsor”), with its principal place of business at 2101 Rosecrans Ave. El Segundo, CA 90245. 3. ENTRY & ELIGIBILITY. To enter the Sweepstakes, follow the directions on the contest blog post (“Entry”). One Entry per household. Entries that are lost, late, incomplete, misdirected or altered for any reason, including hardware, software, browser or network failure, malfunction, congestion, or incompatibility will be ineligible. Only legal residents of the fifty (50) United States who are 18 years of age or older may enter and participate in the Sweepstakes, except employees, agents, or representatives of the Sponsor or any of its subsidiaries, affiliates, or members of their immediate family. 4. PRIZES. 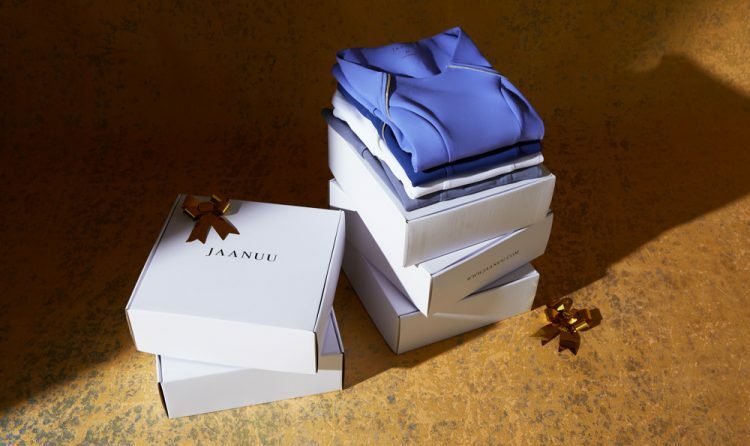 Seven (7) random winner will receive up to $250 in Jaanuu store credit. (Valued at $250). Limit one (1) Prize per Entry. All results and decisions of the random drawing are final and binding in all respects. The odds of winning will depend on the number of eligible Entries received during the applicable entry period. The Prize is not transferable or redeemable in cash and must be accepted as awarded. Taxes related to the Prize, if any, are the sole responsibility of the Winner. 6. SWEEPSTAKES. The Sweepstakes ends at 11:59PM PST on December 16th, 2018. There will be one (1) drawing that will have seven (7) winners. The winners will be notified by email and during the Instagram Live at 12:00PM PST on December 17th, 2018. Store credit will be granted upon confirmation from winner. If the winning Entry is discovered to be invalid for any reason prior to delivery of the Prize, or if the Winner cannot be contacted or does not respond within seven (7) business days, an alternate winner may be selected, at the sole discretion of the Sponsor. If there is no winner by the 30th day after end of Sweepstakes, no further winners will be chosen. 7. GENERAL. This Sweepstakes is governed by the laws of the State of California, United States. All federal, state and local laws and regulations apply. By entering and participating in the Sweepstakes, you agree to be bound by these Rules and by Sponsor’s decisions, which are final and binding on all matters relating to the Sweepstakes. Entrants are required to provide accurate, valid and truthful information at all times. Sponsor will reject and delete any Entry that it discovers to be false, fraudulent, illegal or deceptive and will disqualify any entrant who tampers with the Entry process, the operation of the Sweepstakes, or is otherwise in violation of the Rules. Sponsor is not responsible for electronic transmission errors which result in the omission, interruption, deletion, defect, destruction, alteration, and/or delay of any Entry. Sponsor is not responsible for any technical, network, electronic, computer, hardware and/or software malfunction, problem, incompatibility, congestion or failure of any kind. Sponsor reserves the right to cancel, terminate or modify the Sweepstakes at any time, in its sole discretion, if the Sweepstakes is not capable of completion as planned, including without limitation, the lack of Entry submissions, incomplete Entries, computer viruses, bugs, tampering, unauthorized intervention or technical failures of any sort, without notice. Upon cancellation or termination of the Sweepstakes for any reason, Sponsor shall have no obligation to award prizes or compensation of any kind. I am so happy you are now making the newer styles with the polyester, flex/pointe type fabrics. These newer fabrics do not fade like the previous cotton ones. In addition, they are more stylish and the fabric drapes your body better For a more professional look. I love your uniform styles,. Could you make your lab coats Adam this type of fabric? I only wish I had waited for these new fabrics before investing so much into them. I just recently had my first child and will be returning back to work next week! I ordered a few pairs of these scrubs to try! Wow! They look so nice! Even dressy if that’s possible with scrubs! I’m a working Radiology Director so I need to look professional but still have one on one patient care daily! I’m really nervous about returning to work and leaving my son, but I have to say a pair of these scrubs made me look forward to it! I really hope to win the wishlist competition so I can get some more! Pricy but worth every penny!